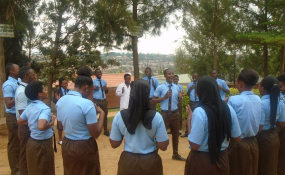 Students at Kigali Leading Technical School during a club activity. Africa's youth-boom is "biggest story in the world right now"
Today in Berlin, a historic conference is kicking off that may prove to be the antithesis of the infamous 1884 Berlin conference that accelerated the colonial "Scramble for Africa". Delegates from across Africa, the group of 20 (G20) leading economies, the private sector and anti-poverty activists will be gathering and planning how to invest in the biggest human phenomenon on the planet today: Africa's population boom. The biggest story in the world right now isn't the Great British Brexit election, or a Presidents latest twitter tantrum but Africa's game-changing youth boom. Africa's population just doubled in size since 1985 - and will double again by 2050 to 2.5bn. By then the young population of Africa will be 10 times the size of the EU's youth population, and equal that of the entire rest of G20 put together. So instead of fruitlessly guessing what is on the American President's or British Prime Minister's mind, we should be far more focused on wondering what these young women and men will be thinking, doing, fearing and aspiring to - for these are far more relevant to our collective future. Because we should - must - be investing in them. And that is the purpose of today's Berlin conference. The German government has proposed a G20 partnership with Africa, with specific investment compacts for an initial set of African countries. This is a helpful start but the compacts need much more fleshing out, especially the implementation of the crucial details on youth education, employment and empowerment. These investments must start with education. Tragically, 100 million African children of school going age are today not in school - especially girls who are out of school when it comes to teenage years. Millions more are in school but not learning anything - because the teachers don't turn up, they are taught in alien colonial languages, not local dialects, or they are too hungry or sick to concentrate. Instead, there needs to be massive investment in their quality education, especially for those secondary school girls, to help this youth boom be future ready. Today Niger has $6 a year to spend per child on education, in a country whose population will treble by 2050, whose government and state apparatus is targeted by highly organised crime and Wahhabist extremists, and whose landmass is crisscrossed by human traffickers, migrants and refugees. German Chancellor Merkel to her immense credit has called for action in this area and if the G 20 doesn't tackle this, and significantly scale effective investment in education in countries like Niger, all other investments will fail. The investment program cannot end with education: the private and public sectors must partner to leverage hundreds of billions of dollars more into African infrastructure and agriculture. This is where the jobs will come from - and 22.5 million more jobs are needed every year to keep pace with the youth boom. This new partnership will be difficult. Knee-jerk anti-corporate activists that fear the private sector are keeping people poor just as much as companies that avoid reasonable regulation or paying their taxes. Both sides must be more responsible. The fact is there are trillions in offshore financial centres, sovereign wealth funds and bond markets which could flow into financing African infrastructure if African and global governments can open up and clean up the opaque armpits of international and national finance systems, - such as anonymous shell companies. The EU anti-money laundering directive is one key opportunity. Worryingly, it is the German government who are dragging their feet and blocking this anti-corruption move. They must get out of the way of this key area of progress. On top of education and employment, these youth must be empowered. That requires making this new partnership conditional on improving the accountability of government to the citizen they serve. The partners must sign up to the excellent Open government partnership, and implement open budget and open contracting as standard practice. Shockingly it isn't now. And of course, nobody can be called "empowered" if they cannot access basic health, nutrition clean water. The threat of three famines in Africa this year is a reminder of this basic fact. Women's access to health services is particularly important to help improve their and their children's health. A basic social safety system to help deliver these is emerging in many African nations but can be enhanced with digitisation and efficiently targeted through better data about the poorest, especially girls and women. Some G20 nations like Brazil and India have much experience in effective safety nets and digital identity systems, and can share this expertise. So the stage is set for this to be an historic conference. It is only just the beginning. There are of course negative forces: for example, Trump in his first budget proposed an aid cut to Niger - one of the world's poorest countries - by 96 percent. Fortunately, the U.S. Congress is smarter and more strategic and will restore much of those funds. But with the rest of the G20 around the table there are enough leaders who get it - who have seen the demographic data and who know that in many ways the 21st century is the African century. Now all leaders must get with this program or face being crushed by the new reality of Africa's population boom - because, as outlined here, there are some facts nobody can ignore. Jamie Drummond co-founded the advocacy organization DATA (Debt, AIDS, Trade, Africa) with Bono, Bobby Shriver, and others in 2002 and ONE in 2004. The two entities merged in 2008 under the name ONE.